With your Bear Cub, you want a potty training plan that respects her desire to be free and easy. If things are too structured, this will turn her off, and the process may take longer. Allow her to have some freedom by pointing her in the right direction, and offer as many choices as possible. Present the potty alongside new opportunities to play. Wait to introduce potty training until your Bear Cub is showing considerable curiosity and can understand the rationale and the benefits of being potty trained and wearing Big Kid underwear. Help him see that potty training will help him get back to doing what he wants to do sooner. Bear Cubs are likely to be curious and excited at first, but also are easily distracted and may lose interest. The more fun and excitement you can weave into the process, the more successful you and your Bear Cub will be. Place a potty chair in the living room, and let your Bear Cub check it out. She might want to stand on it, stack blocks in it, or hey, even sit on it while watching TV. After she grows tired of playing with it in that location, move it into the bathroom. Start reading books about using the potty, both funny/silly ones and more straightforward how-tos. Your Bear Cub may quickly claim a favorite that he’ll want to read every night (or three times a night). Also, keep a basket of potty books in the bathroom or near the potty chair. You can use either a regular toilet with a child-size insert, or a potty chair for potty training; whatever works best for your family. Many children, though, enjoy having their own special potty, and Bear Cubs are no exception. If your Bear Cub wants to watch you in the bathroom, don’t be shy about giving a demonstration. That’s a great way for a Bear Cub to learn. If you are a dad, uncle, grandfather or other male caregiver working with a little boy, it is best to do the play-by-play while sitting down. Standing to pee is an advanced skill better left for later in potty training. Keep it social! Allow your Bear Cub to mix and mingle with her friends and potty-trained relatives in the bathroom whenever possible. Gregarious Bear Cubs will happily watch (and learn from) their cousins, siblings and buddies who have boldly gone before them in mastering the loo. Just be sure to supervise the gang in the bathroom. Despite the fact that this may be a potty party, there’s no need for black tie attire: Dress your child in pants that pull down easily and quickly. Pants with an elastic waistband will be ideal as your Bear Cub works to master the motor skills involved in this step of the bathroom process. If your Bear Cub sits on the potty and successfully puts any pee or poop in, reward him with a silly dance, high five. You might need to remind a Bear Cub to flush, because he might be distracted and forget. Sing a hand washing song to help your Bear Cub keep his focus on this important part of the process. I go to the potty, pull down my pants and sit on the potty. I put the toilet paper in the toilet and flush. I pull up my pants. Now, I can go play again. I feel like a Big Kid when I use the potty! Potty training Bear Cubs can take a lot of patience. But if parents can relax and go with the flow like their little Bear Cubs do, the process will go smoothly. 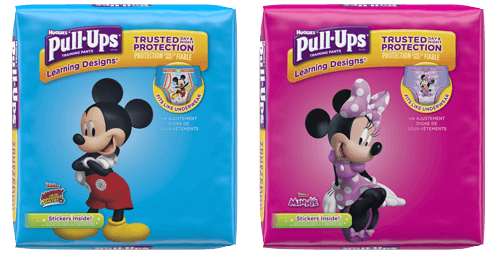 Both you and your Cub will really enjoy the independence and freedom that being potty trained will provide.